When choosing a CRM system, I’ll be the first to say it’s a case-by-case basis. A small 3 person sales team is different than a large company with sales teams spread across the continent. Today, the defacto choice is Salesforce.com, and that makes sense because it’s easily scalable as your company grows. Uhh, your company plans to grow, right? There are a lot of good vendors out there. If you don’t believe me, check out our CRM Vendor listing. It’s so big now, that we sometimes lose track with the new ones as well as the ones that get acquired or simply close up shop. But like choosing cold cereal at Safeway or local grocery store, there are about 5-10 good choices to any single category. Features and pricing are the two largest variables. Of course, marketing and branding will sometimes subconsciously make you choose one over another. Lauren Carlson of Software Advice wrote Salesforce Alternatives: 5 Cloud CRM Systems to Consider. The article is not meant to downplay Salesforce, as it is a great CRM solution, but it is NOT the only one out there. (again, see our CRM Vendor listing) Thus, Lauren wants to make buyers aware of their other options. I know from my experience, a Microsoft shop who loves their Exchange and Outlook email will choose Microsoft Dynamics CRM, and that makes perfect sense in the overall usability for the Sales team. The amount of training is greatly reduced, as well as the amount of resistance! If your Sales and Marketing team work closely together (and yes, folks, that does exists, in harmony) then you have to look into a CRM package that incorporates your Marketing needs. 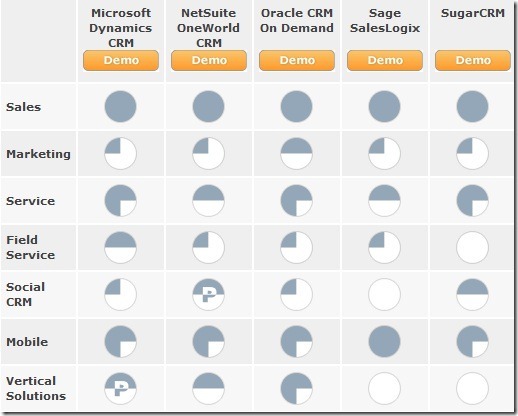 For more information, go to Salesforce Alternatives: 5 Cloud CRM Systems to Consider.